Beetle Frenzy Slot Machine Review - Casino Answers! Beetle Frenzy is a 9-reel, 5-line slot machine developed by Net Entertainment, featuring a wild symbol, scatter wins, a re-spin feature and two bonus games. You can play the Beetle Frenzy slot machine at Bovada. Coin values on the Beetle Frenzy slot machine are $0.10, $0.20, $0.50, $1 and $5. You can select from 1-5 paylines using the arrows above “Bet Level.” You can bet anywhere from $0.10 up to $25 on the Beetle Frenzy dime slot. Beetle Frenzy has a decent betting range that should be suitable for most slots players. You can skill stop the reels manually on the Beetle Frenzy classic slot by pressing the Spin button in mid-spin. 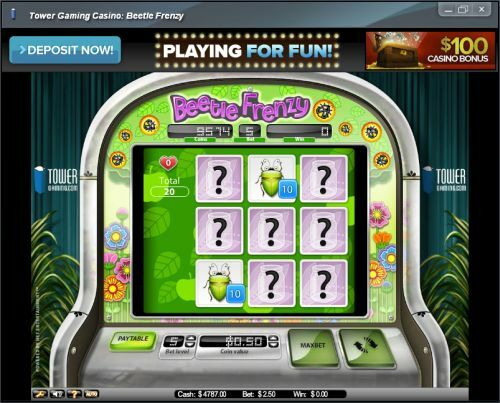 To play the Beetle Frenzy online slot, select the bet level and coin value you wish to play at and press the Spin button. You may also press the “Max Bet” button to play all 5 paylines on Beetle Frenzy. The Gold Apple symbol is the top paying symbol on the Beetle Frenzy classic slot game. If you land cover all 9 reels with the Gold Apple symbol, you will be awarded a Super Win. The Gold Apple symbol pays out payline wins as well as scatter wins in addition to payline wins. You can be awarded a scatter win if you hit 2 Gold Apple symbols anywhere on the reels of Beetle Frenzy. The top scatter win is 400X your total bet. The next highest paying symbol is the Blue Flower, which will pay up to 500 coins for 9 symbols on the reels of Beetle Frenzy. The highest payline win is 40 coins for 3 Gold Apple symbols on a payline. The wild symbol on the Beetle Frenzy online slot game is the Firefly symbol. The Firefly symbol will substitute for all symbols in Beetle Frenzy. The Firefly symbol does not pay out by itself. If the same symbol lands on the four corners or the four sides of the Beetle Frenzy slot machine, you will trigger the Lucky Spin re-spin feature. For each combination that triggers this feature, the middle reel will re-spin one time. If three Flower symbols of the same colour appear on an active payline, you will trigger the Flower Frenzy bonus game. You can win multiple bonus games per spin, depending on how many lines activate the bonus game. Press the Spin button to start the Flower Frenzy bonus game. You will see four reels on the screen with payouts for different symbols. Around the perimeter of the screen will be all of the different symbols. Press the Spin button to stop the selector on one of the symbols. If you land on one of the symbols on the reels, you will win a prize and you will keep playing. If you land on an “X” symbol, the bonus game will end. There are 11 payline winning combinations on the Beetle Frenzy slot machine. The regular payout schedule is as follows (payouts in parenthesis): 2 Ladybug symbols (1), 3 Ladybug symbols (2), 3 Stink Bug symbols (2), 3 of any Flower symbols (2), 3 Beetle symbols (3), 3 Mushroom symbols (4), 3 Milkweed symbols (4), 3 Orange Flower symbols (6), 3 Pink Flower symbols (10), 3 Blue Flower symbols (20) and 3 Gold Apple symbols (40). There are 11 special winning combinations on the Beetle Frenzy slot machine. The special payout schedule is as follows (2-9 symbol payout in parenthesis when applicable): 9 of any Bug symbols (15), 9 of any Flower symbols (50), 9 Stink Bug symbols (50), 9 Beetle symbols (100), 9 Mushroom symbols (200), 9 Milkweed symbols (300), 9 Orange Flower symbols (300), 9 Ladybug symbols (400), 9 Pink Flower symbols (400), 9 Blue Flower symbols (500) and 9 Gold Apple symbols anywhere on the reels (Super Win). Winning combinations and payouts are made according to the Paytable. Wins with all 9 of any symbol pay the all 9 win and any qualifying bonus games or features. Regular payline wins for each winning payline are not paid. Only the highest win per active payline paid. Wins pay if in succession from leftmost to right, except scatter symbols. Simultaneous wins on different paylines are added. Payline and scatter wins are multiplied by the total bet. Wild symbol will substitute for any symbol. Beetle Frenzy has an autoplay mode that can be opened up by hitting the “Auto” button. You can play 10, 25, 50, 75, 100, 250, 500, 750 or 1000 autoplay spins at a time. In the advanced settings, you can set Beetle Frenzy autoplay mode to stop on any win, if free spins is triggered, if the jackpot is won, if a single win exceeds (any amount you input) and if cash increases/decreases by (any amount you input). You can stop the autoplay mode at anytime on the Beetle Frenzy online slot. A rare 9-reel, 5-line slot machine, the Beetle Frenzy slot game has some unique payouts and two bonus games to offer. Beetle Frenzy is definitely a different type of slot machine that we recommend you try when you sign up and make a deposit today at Bovada! Are players from the United States able to play the Beetle Frenzy classic slot for real money? Unfortunately, if you are located in the United States of America, you are unable to play this video slot for real money. For a USA-friendly bug-themed slot that you can play, we suggest the Love Bugs Video Slot at Bovada or you can read our Travel Bug Video Slot Review and play it at Bovada. Where can I play a free flash game of the Beetle Frenzy classic slot machine? 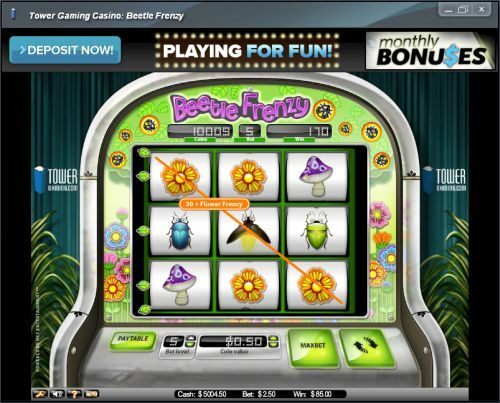 You can enjoy the Beetle Frenzy free flash game right here on Casino Answers! If you experience any issues with the flash casino game, make sure you have the latest version of Adobe Flash Player.